Oh man, do I have something fiery-good for you today. 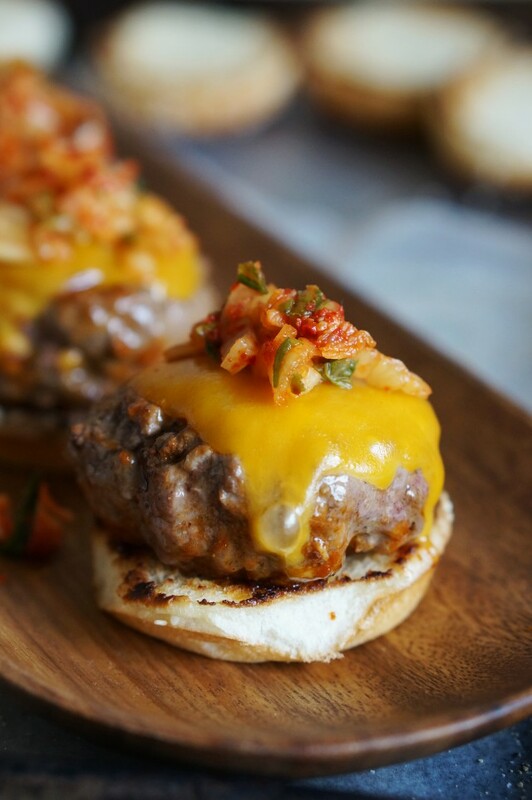 In anticipation of your Memorial Day barbeque plans, I’ve come up with one of my best burger recipes yet: a Korean inspired gochujang BBQ slider topped with cheddar cheese, kimchi and Korean salad. 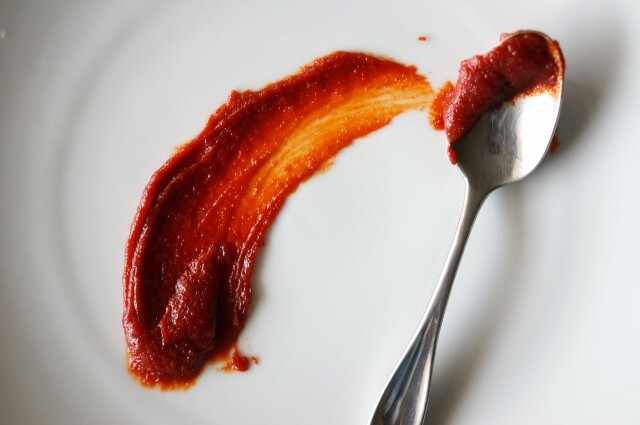 If you haven’t been introduced to the wonderful world of gochujang then I suggest you go buy this fermented chili paste ASAP. It may de-throne that bottle of Sriracha. You can buy it at a Korean market or there are many brands sold on Amazon. 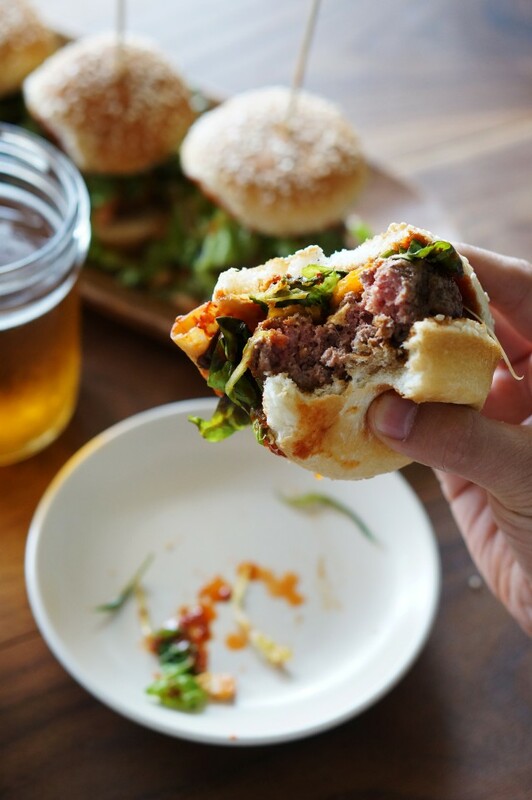 The spicy flavors of the kimchi and sweet and spicy gochujang go so well with beef and cheese, it’s unbelievable. 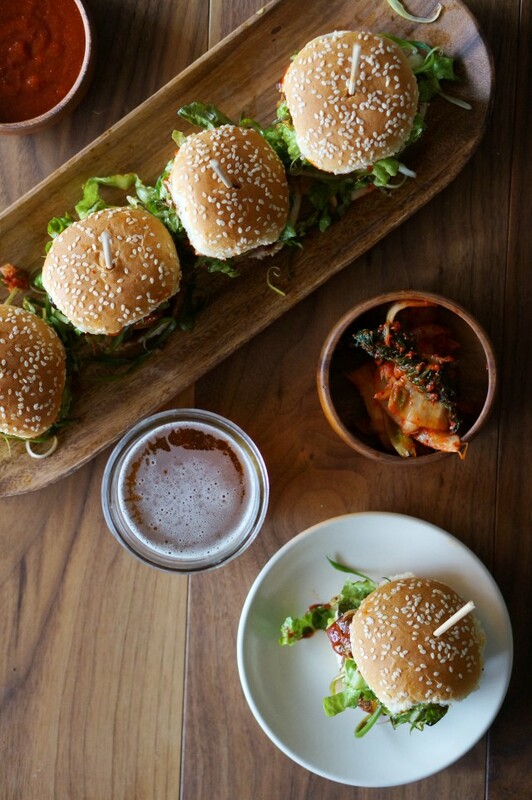 I’ve gone on and on about the marriage of cheese and kimchi before but if you never got around to giving it a try, I’m telling you now– you gotta give these sliders a go! To make the salad, whisk the garlic, soy sauce, rice vinegar, sesame oil and honey together. 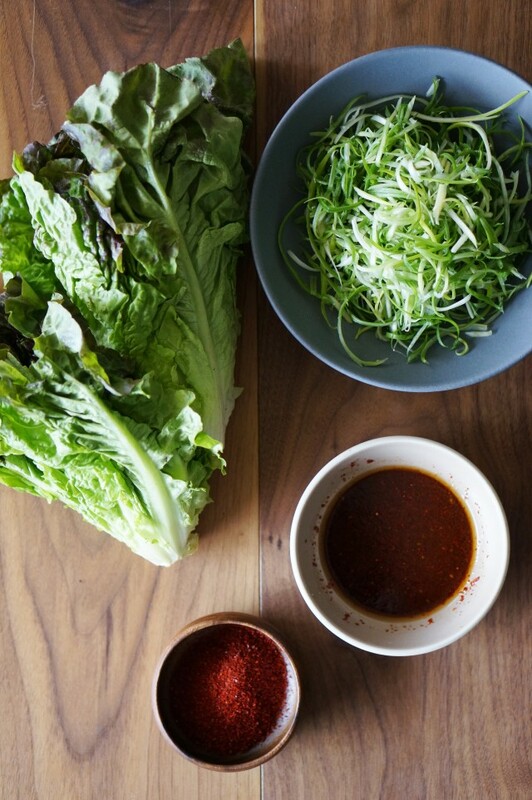 Toss the romaine and green onions in the dressing and set aside. To make the gochujang sauce, whisk all the BBQ ingredients together. Adjust to taste if you like it a little sweeter, or a little spicier. Form the beef into 3.5 ounce patties being careful not to overwork or squish the meat. Place on a baking sheet lined with wax paper. Heat a grill on medium-high heat or on a cast iron skillet. Pour some vegetable oil on a paper towel and wipe down the grill or cast iron skillet. Season both sides of the patties with kosher salt and ground black pepper liberally. Grill the patties on one side for about 3 minutes and then flip on the other side. 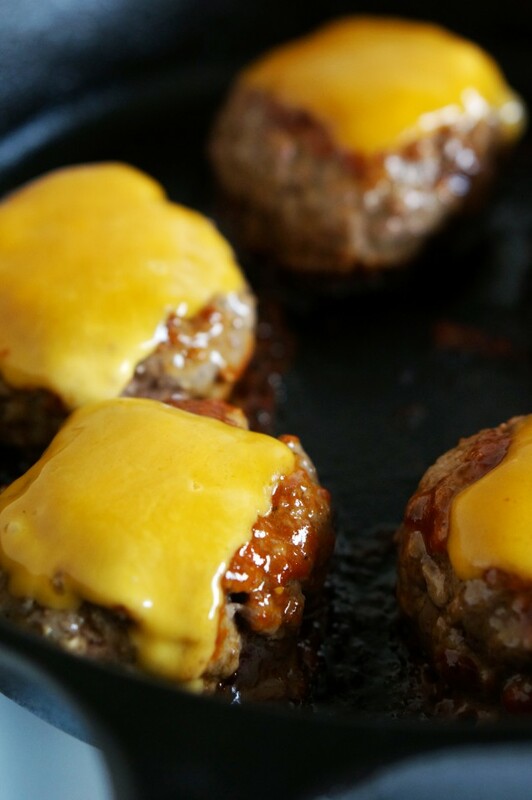 Brush the grilled tops with lots of gochujang BBQ sauce and allow the bottom to grill for about 3 minutes, then flip on the other side and brush the other side with more sauce and top the patties with cheese. Close the grill to allow the cheese to melt or place a lid on your pan. Grill or cook the patties until the internal temperature reaches 130 degrees for medium rare, about 6-7 minutes total. Meanwhile, toast the slider buns on the grill or pan. Remove the patties and top with kimchi and top with cucumber and salad. 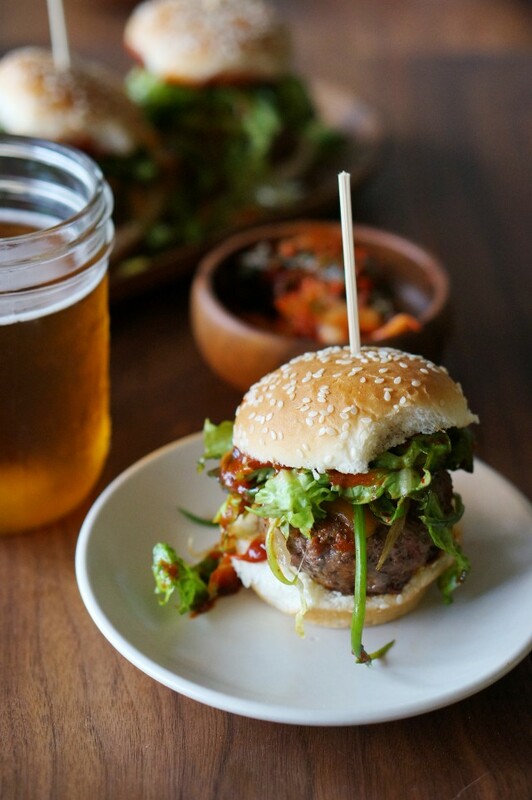 Slather the top bun with more gochujang BBQ sauce. 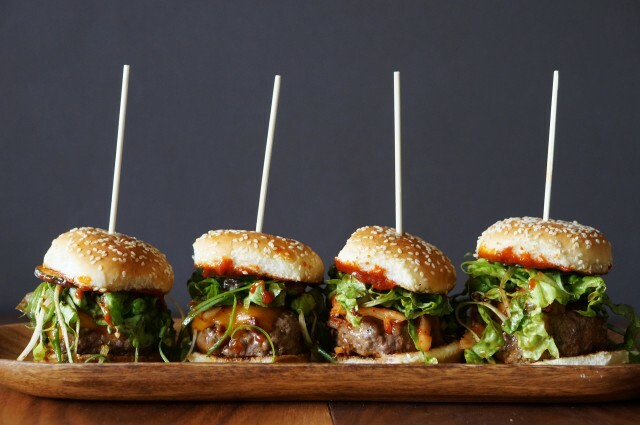 These little burgers look DELICIOUS!!! Um, yes please! These look incredible. 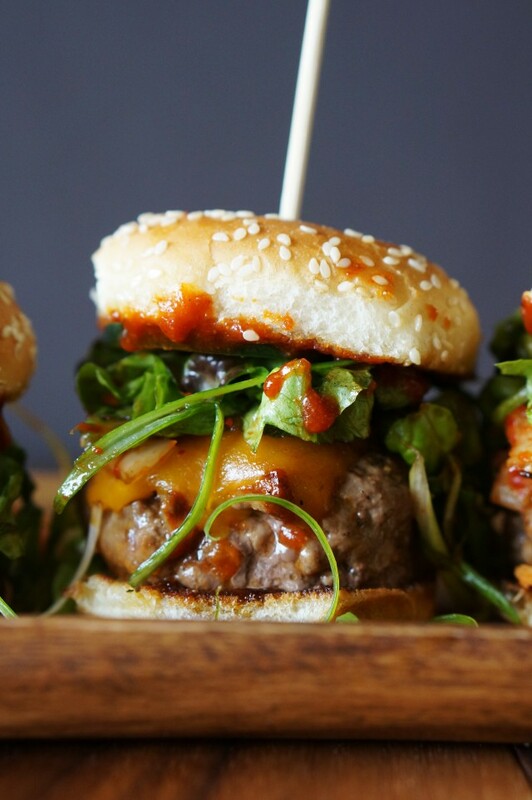 I love gochujang and have a bottle in my fridge just begging to be used for these sliders. I’m drooling over those sliders! Great food photography as well! YES!!!! Karen, you are speaking my love language with these! They’re perfection from top to bottom. Again, intro ducting me to a new flavor! 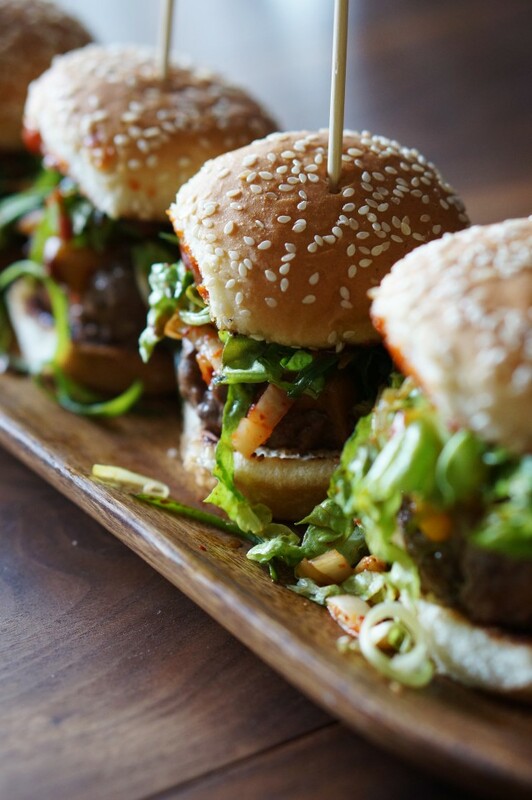 These sliders not only look delicious, but your description makes me want to hightail it to the closest Korean market and pick up some Gochujang!